I’ve started going to bed thinking about the novel I will be writing in November, hoping inspiration about the proposed book will invade my dreams. Last night it worked, although it was while I was still lying awake and not yet into dreamland. I thought of a new twist for the mystery that makes logical sense to the plot. Of course then it took hours, or so it seemed, before I made it into dreamland. And then the only thing I dreamt about was silly stuff, like climbing a tree in search of a fish and coming face to face with a grizzly bear and then watching it turn into a stuffed teddy bear. Does anyone else have such weird dreams? 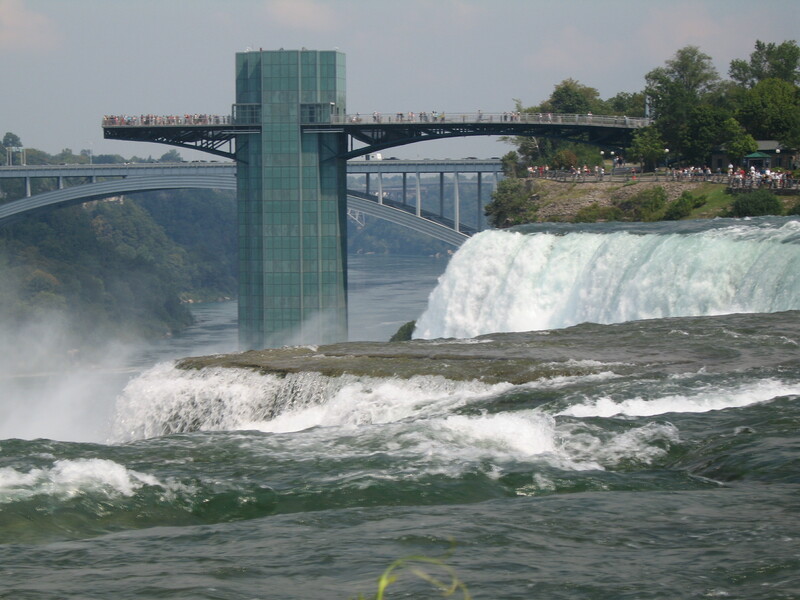 I visited Niagara Falls when I was a kid and took the Maid of Mist boat ride. Couldn’t see a thing cause my glasses were covered with water, and I was very near-sighted then. Then visited in the 70’s. Had to stay on the US side cause we had our dog with us. Stood on Goat Island and let the water come out from under my feet. The noise is incredible. As for crazy dreams – all the time!! I have strange and crazy dreams quite often, although I don’t think they will ever result in a novel. I visited Niagara Falls with my family while growing up and then with my husband on the last trip we did before children. It is a spectacular destination. Like you, I have also been preparing for NaNoWri Mo. Maybe that’s where my wild dream came from the other night. I was being chased by dinosaurs. One was bigger than Rudy in “Ice Age: Dawn of the Dinosaurs”; and it was speaking to me. My daughter insists it was a Spinosaurus. Perhaps I have watched this movie one too many times. You had me belly-laughing at the Spinosaurus comment. I just commented on another blog and where I meant to write ‘roads”, I wrote “words” instead. Perhaps it bodes well for our NaNoWriMo efforts that our minds are already on the writing. Good luck. Pay, the Falls are beautiful! Keep dreaming, something will awaken you and you will feel the urge to wake up and write! I can sense it! Sorry, I meant PAT, my sticky fingers. I have to double check my spelling next time especially since I’m typing to the next author friend. Thanks Martina. Re the Pay instead of Pat … I just sent a reply to a blog in which I meant to say roads and I said words instead. I think NaNoWriMo is messing with my brain. Good luck with this Pat, for the first time they have had coverage on the BBC news programs. Interesting to meet two authors, one who has since been published, and another who was trying it for the first time. They also interviewed an independent publisher. Talking about the amount of new work they wade through. The e-publishing world keeps growing though, but that may not be a good thing. I am just trying to write 500 words a week on my story on another blog, and still keep up with my poetry on notyethere. Its enough for me at the moment. We all have to find what works for us. What’s sad is that some people think there is only one way to live life. Not me. Staying within the lines is boring. I love your blog, and your poetry often speaks to me. Keep doing what’s right for you, and what makes you happy. This old broad has thoroughly enjoyed our back and forth communications. You often give me a new outlook and new things to think about. Thanks.